Evin watched the birds with the intensity of a starving man. They picked their way across the hard packed ground flying only when necessary. All that came from Evin was a low sshhhhing sound. His jerkin moved little as he watched the birds from under lidded eyes. "What in the cold Hells are we waiting for?" Just then a quick glimmer of light flashed off of some weird bauble one of the birds picked up and then it was dropped as two female crows fought over the thing. The thing smelled of damp algae & dungeon funk. "And now Alas we know where the dungeon is & where the entrance is to the dungeon is." "Its in the well!" "You've been watching the birds scavenging in the run off creek of the ancient aqueduct"
"Very smart Evin, I'll get the horses & our stuff", Alas the half caste warrior quickly made his way to the shrine's stables. 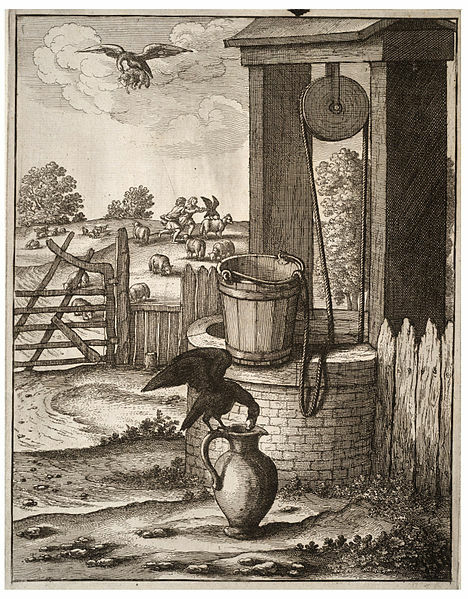 Crows are both cagey & canny, they are drawn to the occult & supernatural as a starving man is drawn to food. They're intelligence is keen & yet utterly alien to mankind making them perfect conduits for the strange radiations & energies of dungeons & ruin locations. These place of dark forces & weird alien ecologies draw these birds as no other. Many times crows will pick up baubles, trinkets, & small items only to become infected with the strange energies & occult radiations that infect these items. They become changed somehow by these elemental & dangerous occult forces. 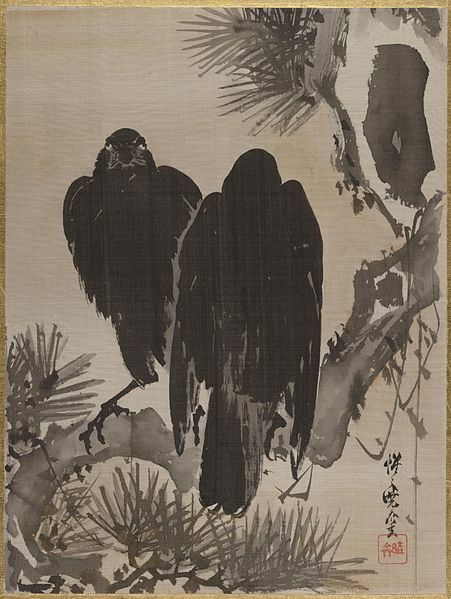 These crows gain a strange & almost demonic intelligence about them. Again & again they are drawn to the evil of the dungeon. These birds are sought & summoned by necromancers & other black wizards for their intellects & the strangeness of them. 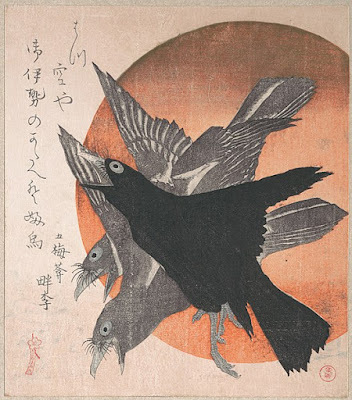 Each of these 'changed' crows will have a human style intelligence score of three or better. The mummified pinky finger of a dwarf with a 20 caret signet ring containing a hidden compartment containing a fabric map. A small silver holy symbol belonging to a priest of Lemuria a thousand years old. Worth 50 gold pieces because of the acid etched damage on one side. A silver medallion containing the soul of wizard that once belonged to a notorious lich king. His dungeon is said to be nearby and the crows his eyes . The medallion is curiosity worth 100 gold pieces to the right collector. A flawed diamond containing a deadly teleporation spell to a dead treasure world of the Eld. This item is cursed with a strange destiny about it. A shiny golden key belonging to the minister of treasure vaults long dead two hundred years. A ghost follows this key throughout eternity. A small one inch high onyx cat that will animate in the hands of a pig farmer. The cat will lead the party to great dungeon location for a saucer of milk which it will demand telepathically. A fake wooden eye ball with a map of a nearby area drawn on its surface & circumference. A small dime sized piece of white jade with twenty two sacred characters on it. These are said to be names of the twenty two most powerful fallen ghost kings of the damned. Their cemetery is supposedly nearby or within the region depending upon the rumors that the party listens to. A small amulet that once belonged to a priestess of Freya. The amulet will magically point to a true heir of a fallen kingdom. This fool can open the door to underground kingdom of the dead. The artificial nose of a priest of Odin; this item can literally smell gold within a thirty foot radius. It can also smell the blood of terrible warfare up to four miles away. The owner will be drawn into any intrigues of battle and power by this item. This nose can & will lead the owner to trouble every new moon unless a prayer to Odin is uttered.